After you download your poster, we invite you to learn more about VersaCare, the industry's leading telemetry monitoring solution for cardiac and pulmonary rehab departments. VersaCare features integrated program management and outcomes, mobile functionality, on-the-fly editing, seamless EHR integration and more. For even more details, request a free live online demo of VersaCare tailored to your department's needs and concerns. 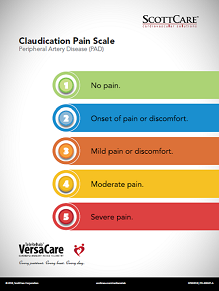 Hanging this popular poster in an area clearly visible by your patients will help guide them regarding their claudication symptoms during their exercise regimen.